"More Fish - Better Fisheries"
Since our beginning the goal of the North Coast Salmon & Steelhead Enhancement Fund (NCSSEF) has been to generate funds to be invested in fishery enhancement projects along the north Oregon coast. Our success has been, and continues to be, impressive and we have contributed millions of dollars, and leveraged millions more, for fisheries enhancement projects. NCSSEF is a tax exempt 501(c)(3) organization. 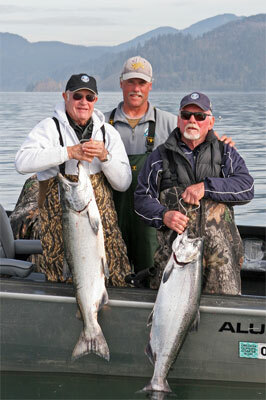 The North Coast Salmon Rendezvous serves as our primary fund raising endeavor. This fun filled event began with a group of concerned anglers wanting to generate funds to support the development of a winter Chinook fishery in Tillamook area rivers and acquire strategic pieces of property for public access. Hosted for almost 20 years by the Oregon Wildlife Heritage Foundation the Rendezvous is now under the direction of the NCSSEF and remains "the fishing event" on the north Oregon coast. It consists of two full days of fishing with professional guides (or highly qualified anglers), outstanding food, a friendly competition, fund raising auction, and lots of comaraderie. Many of our participants come back year after year. In fact, just getting a seat in the Rendezvous has become a challenge with return participants having the first chance at the next year's seats. The points based competition keeps things interesting and guides are selected by random drawing for both days. The winning four person team will go home with beautiful trophies and a package of donated items that in the past has consisted of custom jackets as well as new premium rods. The 2019 Rendezvous will be held on October 23rd, 24th and 25th at the Old Mill Event Center in Garibaldi, Oregon. We look forward to seeing you there!